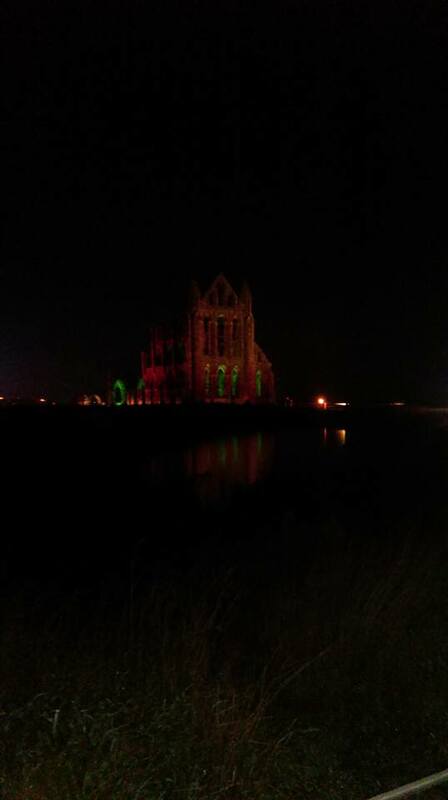 If you are a fan of Bram Stoker's Dracula, then Whitby Abbey was the place to be this Halloween. 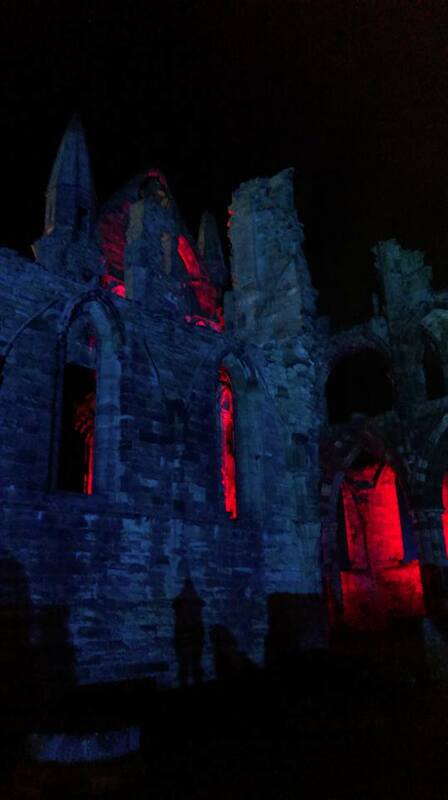 Seen as never before, Whitby Abbey was lit up in different colours, from Blue, Green Red and Purple creating a chilling atmosphere. 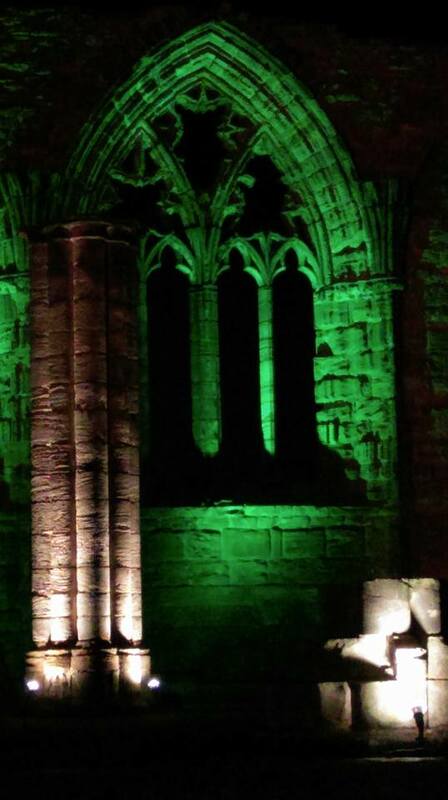 I decided to have a walk around the Abbey on Wednesday night to see what all the fuss was about, and was glad I did! 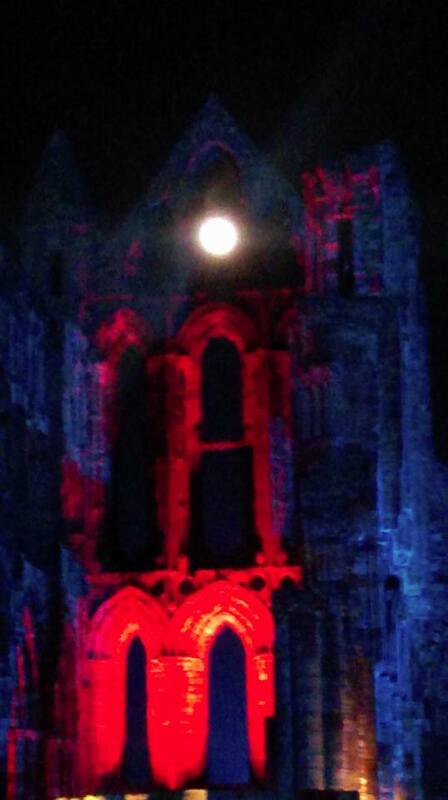 Adding to the atmosphere was a spectacular full moon which made the night even more memorable. After paying to get in, you take the long walk round to bring you round to what must be the most famous image of the Abbey, that by Frank Meadow Sutcliffe, taken in front of the Abbey with the lake in the foreground. If you stood in the right place you were able to see the Abbey's reflection in the water, as the lights were shining through the bottom windows with the top of the ruins blending into the blackness of the night. 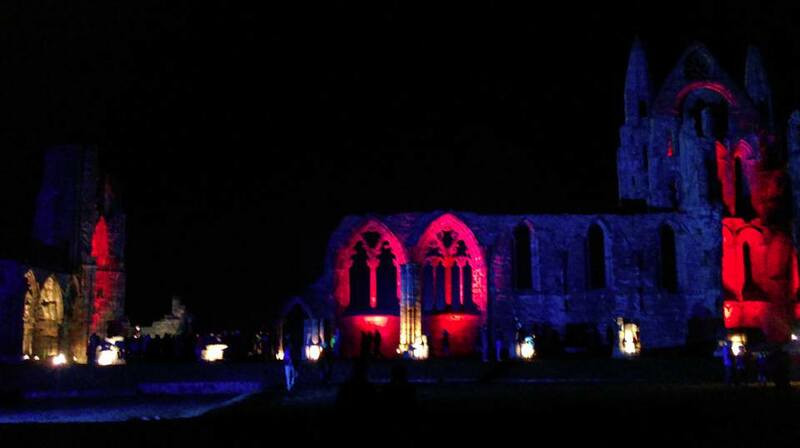 As you keep walking round the ruins, the lights all of a sudden change colour creating a different, moodier atmosphere to the last one. 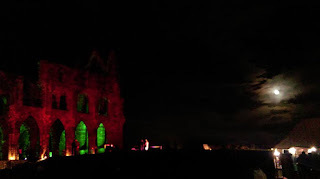 At each end of the ruins there were different actors, all dressed up in various different outfits, telling all sorts of tales like that of Sweeney Todd and other gruesome stories which fit in nicely with it being Halloween. 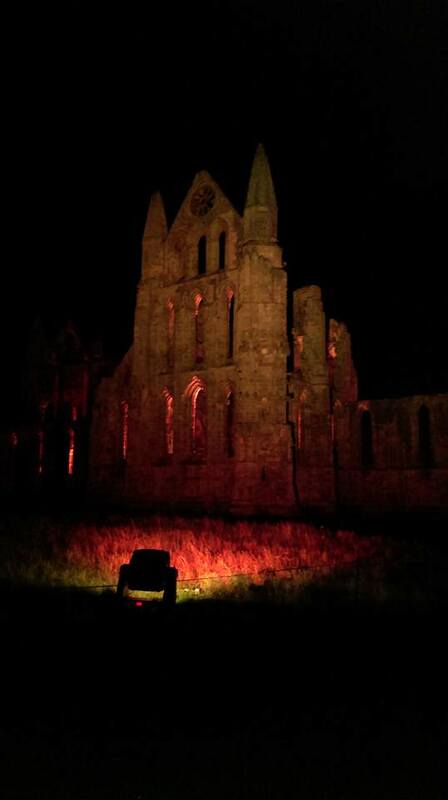 At about 8.15pm, the crowds started to gather round the actors in the middle of the ruins. 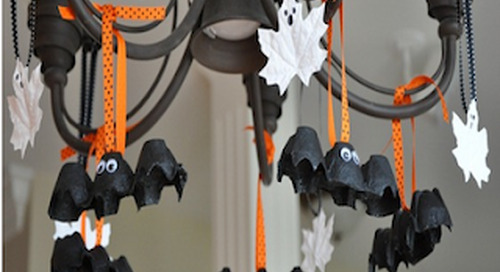 What came next was a dramatic recital of part of Bram Stoker's Dracula. 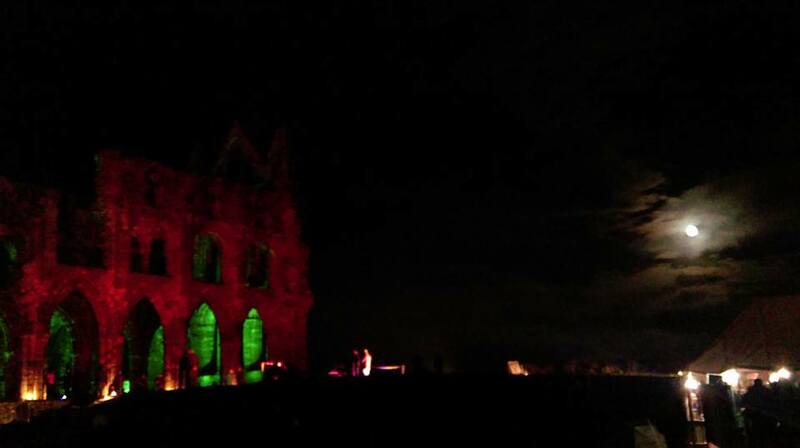 The actors were amazing and got the whole audience involved with the retelling, and what better back drop to have than that of the Abbey all lit up creating the spooky atmosphere needed for the telling of Dracula! 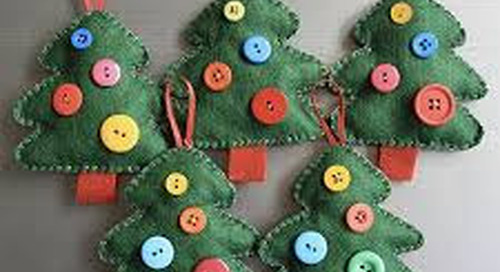 There was also a few stall around selling all sort of different wonderful things. If you were feeling a bit thirsty you could also get a nice cup of mulled wine or cider to warm you up, as it was a bit on the chilly side. I could have spent all night there just taking photos from different angles in the different lights as every picture you took was different!. It is really hard to describe just what an experience it was as it is one of those where you have to be there to experience it. There are just no words to describe what it felt like standing amongst those ruins in the pitch black and dark moody lights lighting up the ruins. 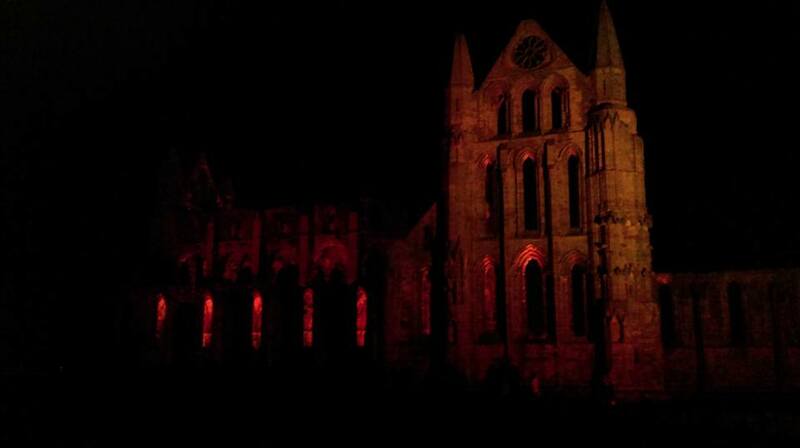 This spectacular light display also coincided with the annual Goth Weekend in Whitby. So not only were we hunting for Dracula amongst the ruins but also looking out for the Goths and their amazing outfits!! I certainly hope that they do this again next year as i will definitely be going to look round again!